When most people think of manga, they revert to established titles like Naruto and One Piece. But in reality, there are hundreds of manga series running right now, many of which have English adaptations. And a bunch of really good ones have just started up recently. Now, a lot of the manga on this list started in Japan way before 2015, but all of these series began their official English-language publication runs in 2015 in the United States. Many of the manga listed here already have anime adaptations, and perhaps you have seen a number of them. All the more reason to check out the manga, which almost always manages to give you more background, character development and plot clarity – not to mention a continuation from where the story ends. Whether you’ve seen the anime or not, have yourself a look at the best new manga of 2015, and thank me later. One-Punch Man tells the story of Saitama, a former salaryman who started working out and – whoops – ended up becoming the strongest man in the universe. Now he is a superhero who defeats every enemy in one effortless punch. Sounds boring, right? Well, it goes deeper. What Saitama wants is a knock-down, drag-out fight that gives him a feeling of danger, of tension. So every time a new monster or rival appears to challenge him, he gets excited, then ultimately disappointed in the outcome. He comes to be depressed with his own extreme power. Meanwhile, since Saitama makes every fight look completely effortless, he is unable to draw any respect or admiration from the public he protects, all of whom assume he’s either cheating, or simply jumping in to take credit for other heroes’ hard work (after they’re all beaten senseless). The fights between the monsters and the other heroes in the series tend to be where all the high-octane action comes in, and for anyone looking to get their “high-powered battle” fix, this is where you get it. Generally several chapters are devoted to evenly-matched heroes and monsters doing jaw-droppingly cool attacks on each other before Saitama comes in and ends things immediately without even warming up. One-Punch Man is a work of genius, which simultaneously parodies and outdoes typical shonen action series. It is brilliantly drawn by Yusuke Murata (of Eyeshield 21 fame), to the point where some chapters are completely art-focused and basically just serve as a platform for Murata to show off his chops. In addition to the above GIF, there are several more animated chapters here, including one in color. 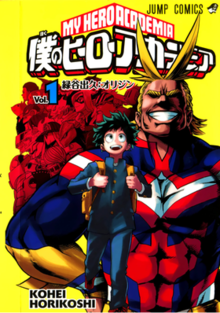 Though it sounds like a story about someone who helps you through college, My Hero Academia is actually about a school for superheros. More specifically, it’s about a world where most people are born with some kind of special power – except, somehow, Izuku Midoriya, who pretty much has nothing going for him. Still, he wants to grow up to become a super hero like his idol, the legendary hero All Might. Despite having no powers, All Might sees Izuku’s value one day when he stands up to protect his bully from a super villain, and begins to train him to become a hero himself. The really entertaining thing about My Hero Academia is meeting the characters and understanding their abilities. While these abilities – called “quirks” – are undeniably powerful, they are also very, well, quirky. One character has explosive palm sweat. Another can make things float just by touching them, but the ability makes her nauseous if overused. Another still has a belly-button laser that will cause his stomach to collapse if he uses it longer than a few seconds. The unusual nature of the heroes and their powers, and the easy-to-root-for protagonist, make this a great read, in which it can be legitimately difficult to imagine what happens next. Your Lie in April is for the sensitive hearts and music-lovers out there. It follows Kosei Arima, a world-famous child prodigy on the piano whose harsh upbringing forced him into a nervous breakdown on stage at age 12. Two years later, he hasn’t touched the piano since, his mother (also his ultra-strict piano instructor) has died, and he can’t even hear the sound of the piano anymore. 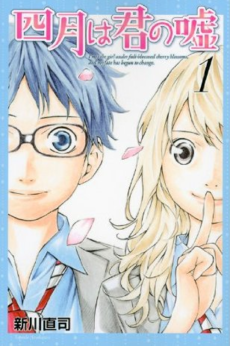 The two of them start playing together, Kosei picking up the piano for the first time in years, and they each seem to fill in something missing from the others’ life. The relationship between the two of them is heartwarming, and it makes the tragedy aspects of the series that much more poignant. The series is only 11 volumes, and despite starting in 2015, the full series is expected to be released in the U.S. by the end of 2016. I highly recommend Your Lie in April if you’re a fan of any sort of music-related anime or manga, and you’re ready for some pretty intense feels. 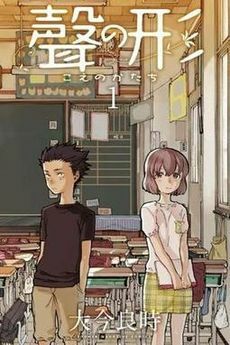 Easily the most thought-provoking series on the list, A Silent Voice is a series about bullying – from the perspective of the bully. Shoya Ishida was part of a group of students in elementary school who bullied Shoko Nishimiya, their deaf classmate. The bullying gets so intense that Nishimiya transfers away – and with her gone, Ishida himself becomes the new target of his classmates’ bullying. Ishida goes through the next few years isolated and mostly without friends – until he reunites with Nishimiya well into high school. Nishimiya is also isolated and lonely, and Ishida attempts to make amends for his past sins, recognizing that he is largely responsible for both of their situations. It’s a story of redemption that doesn’t always go smoothly, but does make you feel pretty good about having faith in humanity again. It can be a bit real at times, especially for those with experience on the receiving end of a particularly cruel bully. But it is an interesting look into the head of a bully who is trying to repent for the suffering he caused in the past. My friend Liang probably gave the best description imaginable of Haven’t You Heard? I’m Sakamoto (or Sakamoto desu ga? in its original Japanese). And having read it myself, yes. That is the whole plot. It’s a comedy series about a guy in high school who is simply relentlessly cool no matter what he does. Jealous bullies, girls and rivals all try to get the better of him, and somehow they all just make him cooler. It could be obnoxious, but it’s honestly hilarious. Most of the humor comes from those around Sakamoto who are desperate to crack his legendary composure. Like Elmer Fudd trying to trap Bugs Bunny, the plans (even the well-laid ones) universally backfire and make Sakamoto himself look that much cooler. Ultimately, the people trying to trip up Sakamoto give in to his overwhelming cult of personality, because it’s honestly just useless trying to deny him. Eventually, he starts helping others with their problems, but in unexpected ways – helping a bullied kid being extorted for money by getting him a job at McDonald’s (and working alongside him) to make more money, for instance. It’s not the type of manga to try if you want a deep, overarching story. But if you’re looking for some episodic comedy that parodies the “cool bishounen” trope by dialing it up to 11 out of a possible 5, Haven’t you Heard? I’m Sakamoto is a great time. Hey guys, do you like Fruits Basket? Let’s go down the checklist. Orphaned girl living with a bunch of guys in the woods. Check. The guys are supernatural. Check. A bunch of them look like animals. Check. They’re also super hot. Check. Don’t get me wrong, The Demon Prince of Momochi House isn’t the same story as Fruits Basket, not by a long shot. 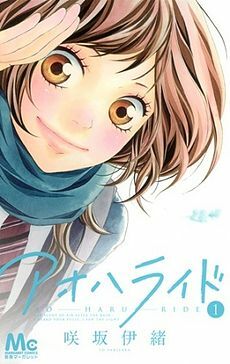 But the similarities are certainly there, and like Fruits Basket, this is shoujo manga for people who love shoujo manga. The story centers around Momochi Himari, an orphaned girl who inherited a house considered by many to be haunted. She goes anyway, only to find that the house is already inhabited by unusual men: Aoi, Yukari and Ise, who may or may not be combating evil spirits. Himari is told to leave. She decides to stay (it’s legally her house, after all). And it escalates from there. If you’ve been looking for a new, somewhat supernatural shoujo manga to get into, – one that doesn’t involve goth themes and vampires – here you go. 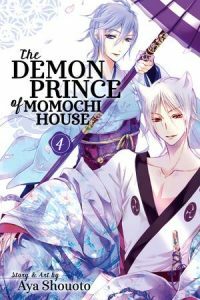 The Demon Prince of Momochi House is probably going to scratch that itch – or at least look great serving you a mean cup of tea. A lot of sports manga centers around a guy who is already naturally skilled and kind of wild, who eventually comes to realize his potential by joining up with a team. 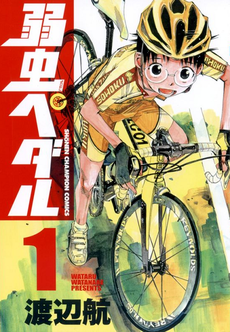 Yowamushi Pedal is… kind of like that, but kind of not. Sakamichi Onoda is an otaku who lives on the outskirts of Tokyo – making it especially difficult for him to get to anime paradise Akihabara as often as he would like. So he rides his bike to get there (close to an hour both ways), and thus cycling becomes a sort of hobby for him – but not one he takes seriously. 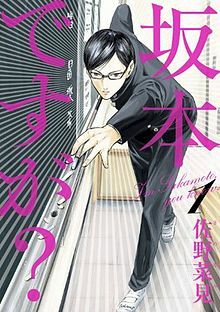 Sakamichi is excited to join the anime club in his new high school, but finds it disbanded, which devastates him. He rides his bike to Akihabara to make himself feel better, and runs into a fellow student there – a member of the cycling team who recognizes his stamina and ability as a rider. After a fair amount of convincing, Sakamichi joins the club and begins his transformation from shy, nerdy introvert to someone who is still nerdy, but is confident in himself and able to speak his mind. It’s a gratifying story, as you see Sakamichi earn the respect of his peers and fit in with an athletic club he never thought would suit him. You learn a thing or two about cycling, too. 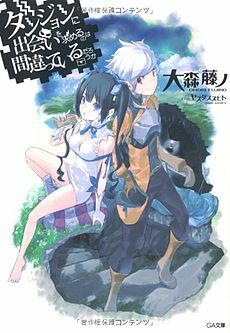 If you think Is it Wrong to Try to Pick Up Girls in a Dungeon? is a long, unwieldy name, you should try out the Japanese equivalent, Dungeon ni Deai o Motomeru no wa Machigatte Iru Darou ka? For sanity, let’s just shorten it to Dungeon, yeah? Dungeon is set in an MMORPG-type world like Sword Art Online, only there’s no subtext of it being a game, the world just is what it is. Still, characters go into the dungeon, fight monsters, even “level up” and gain new abilities. There are also clans, called Familia, run by the gods and goddesses of the world, and each adventurer has to basically swear fealty to one of those gods to become an adventurer. The more followers a god or goddess has, the more power and social standing they have. This brings us to Bell Cranel, a beginner adventurer who is the sole member of the Hestia Familia. Hestia, the goddess in charge, dotes on Bell and does whatever she can to help him, though they both lack much in the way of power. One day, Bell wanders a bit too far into the local dungeon, and finds himself in an unwinnable encounter with a minotaur. After accepting his death, he is saved at the last moment by Aiz Wallenstein, a beautiful, powerful, and famous swordswoman. The encounter both sends Bell head-over-heels for his savior, and also frustrates him about his own lack of power. This awakens an ability in Bell that exponentially increases his rate of growth for as long as he feels a strong longing for Aiz – but only Hestia, Bell’s goddess, knows about it. Jealous, Hestia keeps the information to herself, even though she stands to benefit from Bell’s rapid growth. It’s a bit cliche, as it ends up turning into a situation where Bell goes from weakling to highly powerful, all the while women he interacts with fall for him left and right without him even knowing about it. Still, the setting is interesting, and it’s fun to see the way the love pentagon sorts itself out (or not) from chapter to chapter. 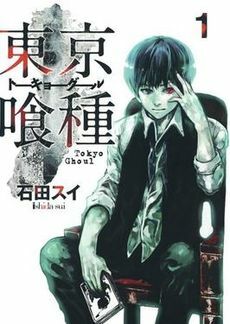 Easily the most adult-themed manga on the list, Tokyo Ghoul is set in a modern-day world in which creatures called “ghouls” must eat human flesh in order to survive. Ghouls blend in with normal human society and, while they are several times stronger and more dangerous than ghouls, they can only be told apart under special circumstances. So when Ken Kaneki goes on a date with Rize Kamishiro, he has no way of knowing her true intentions until it’s too late. The encounter leaves him hospitalized, and forced to undergo a surgery to make him a half-ghoul to survive. Now Kaneki must also eat flesh to survive, and the story follows his struggle to adapt to his new life, while also keeping his new identity secret from his old companions. The original Tokyo Ghoul story ended in 2014 in Japan, but a sequel series, Tokyo Ghoul: re is still running, and there’s also a short spinoff series, Tokyo Ghoul: JACK. If you decide to jump into this one, make sure you start with the right series. 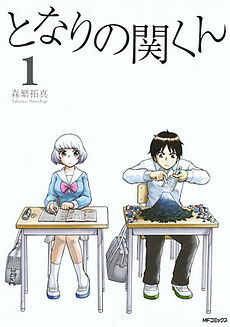 The main character in this series isn’t the titular character, it’s the girl who sits next to him in class. Toshinari Seki is a weird kid. He carries out elaborate hobbies at his desk in class, and somehow never gets caught doing it. His desk “neighbor,” Rumi Yokoi, tries really hard to pay attention in class, but can’t help but notice – and internally comment on – the unusual activities Seki is engaging in. This is the bulk of the series content, right here. It’s a classic Japanese comedy set-up: One character (Seki) being the crazy/stupid one, with the other one, the “tsukkomi,” (Rumi) makes a comment about how ridicuous it is. That’s should give you a good sense of how the series goes. If this sounds like something you could laugh at, I recommend reading it. If it sounds outright stupid, I recommend reading something else.